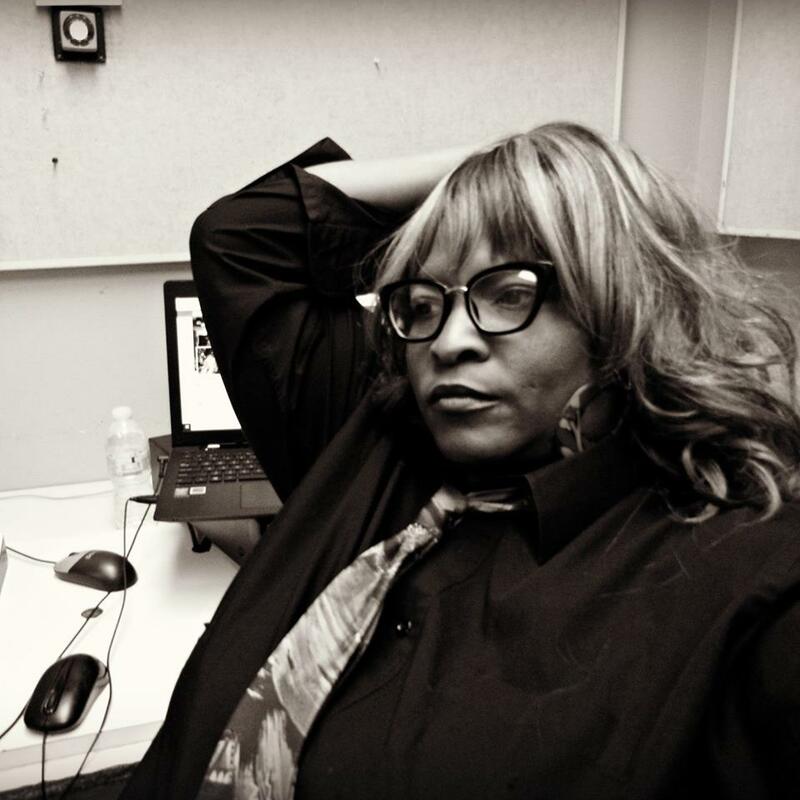 Written, directed, and produced by local playwright and advocate Trinese Duplessis, the play has from the get-go, a large, in charge, and powerful energy to it, all of which can be traced back to Trinese’s promoting skills and self-pitching. She’s a true independent spirit, one that speaks at volume for everyone to hear, including those all the way in the back row. I asked her some questions about the play, it’s inspirations, and what she hopes audiences will gather from it. She obliged and made her answers an event all by themselves. Bill Arceneaux: What would you say was the moment that inspired you to put on this stage play? Trinese Duplessis: I would say (the idea came) about two years ago. I am very active on social media with many platforms I use for theater, TV, and radio. I would see so many stories, articles on Facebook and in the news about some beautiful child getting bullied and committing suicide. I remember growing up, (being) bullied, and it did not feel good. I attempted to do a collaboration with a non-profit company in Atlanta on bullying in 2017, but it fell through. My heart has always been itching to do it, so I decided to do it myself in my hometown in New Orleans. My first original play was called Saving Justin about two best friends who had two different backgrounds, one was rich and one was poor. It displayed peer pressure, drugs, bullying etc. I pulled a little from that play and incorporated it into Chalkboard Bullying and made it more up to date, especially with the cyberbullying! BA: Do school officials, adults, and children treat bullying differently today than decades ago? Were things any different when you were a student? Trinese: Yes, it was very different when I was growing up in the ’90s. Parents and teachers were much more involved in the students’ life. I remember when I was attacked by three girls on my sweet sixteen birthday at the bus stop, although some classmates just watched, and the bus driver did not stop the fight, I still got on the bus embarrassed, ashamed and I proceeded on to school. However, once the principal found out, he immediately called my parents. My parents pressed charges against the girls and it was resolved. Today, it won’t happen like that so easily. Some parents may be overworked and don’t have the energy and time to deal with the issue or they simply believe it is not that big of a deal. Some teachers are overwhelmed with little pay and overcrowded classrooms. Some educators have given up, stopped caring. It is a vicious cycle, these schools need support, funding, and the parents need to believe and listen to their children before they make headlines in a newspaper. Bullying is a very serious matter, as it can affect the mental psyche of a child. It affects the bully and the child who is being bullied. Suicide can be the end result, or the child can harm other students out of anger. We have to bring awareness and do something about this epidemic! BA: You’ve staged other plays before, but what makes Chalkboard Bullying different for you? Trinese: It is different, because I am working with the youth, and they have so much talent and are very gifted. Our young teens and children are our future leaders, and if I can help them see the beauty in themselves, even the bullies or potential bullies by educating them through a drama stage play, then I have done my duty. I feel as though I will inspire so many families with this play, I believe the bully will be transformed, the parents will be transformed, the teachers, educators, principals will be transformed, and most of all the youth will be transformed and pass the torch by spreading this message! I also believe I will inspire young playwrights to find their callings as artists. It’s a win-win for all!! BA: McDonogh 35 High School will be hosting the event. Have there been any stories of bully experiences shared with you by students and faculty? Did you consult/research with others in writing the play? 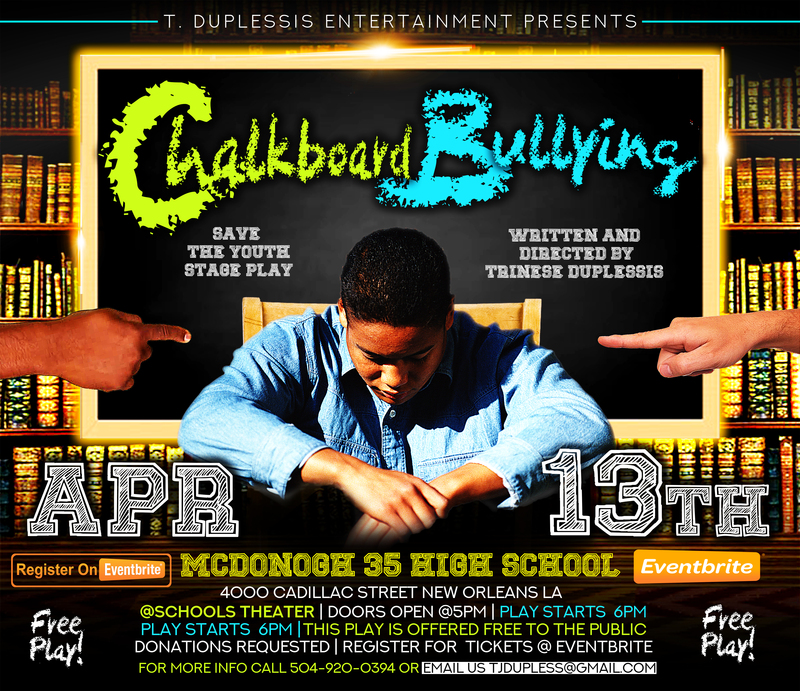 Trinese: When I first had this idea to do a play dealing on bullying, I contacted my fellow Warren Easton classmate Harold Clay, Jr., who is the amazing Principal of McDonogh 35 Senior High School. He was excited and on board. I am honored to do a play at McDonogh 35 Senior High School, and I thank Harold Clay for his vision for the students, and school. He is doing a phenomenal job as a principal and leader. However, I have spoken to a few students and teachers who teach at other schools, who are my friends. They all have experienced some type of bullying in their lives, some more extensive than others. Most of the teachers have addressed the bully issue, and some went on deaf ears. Unfortunately, the teachers have gone to funerals of students who have been bullied. One of the female bullies in the play, she is not a student but a published author named Taga Dawson. She was bullied her whole life and tried to commit suicide a few times. She tells her story in her book of poetry. She plays the role as an older bully, who has failed a few times in result of poor upbringing and a bullying parent. This role is a challenge because she has to go back in her past to relive those moments, but this time she is the offender and not the victim. My male bully Tommy Denney, who is a McDonogh 35 Senior High School senior, who has never been bullied in his life, this is a challenge for him to play the role as a bully, but he is very talented. Some research reported according to Wallet News financial writer Adam McCann: Every 7 minutes in the US a child will be bullied. Only 4 in 100 adults will intervene, and only 11 percent of the child’s peers might do the same. Eighty-five percent do nothing. According to the CDC 2017 Youth Risk Behavior Surveillance System, 19% of students in grades 9-12 said they were bullied on school property in the previous 12 months, and 14.9% of students were cyberbullied. This has to stop now, and it is alarming! BA: What more can local schools do to curb bullying? Trinese: First of all, have a bullying awareness on a regular basis. Build programs to teach parents, teachers, and students on how to handle the issues, and teach them the warning signs. Also do productions such as the one I am doing, to bring light to it live on stage. It does not have to be on a real large scale, but maybe small skits throughout the year. Action speaks louder than words. Principals need to reach out to local artist in their communities and do free concerts and fundraisers. Local government needs to have more funding and incorporate this in a classroom a setting, make it a class requirement. Bring awareness to teen suicide, we can not be afraid to talk about this, we are losing so many.